Diamond RHM8B as stand-alone antenna. I have had the Diamond RHM8B as my emergency antenna in my SOTA pack for some time and in fact used it to activate DL/MF-026 Wallberg when I couldn’t get the dipole antenna out. 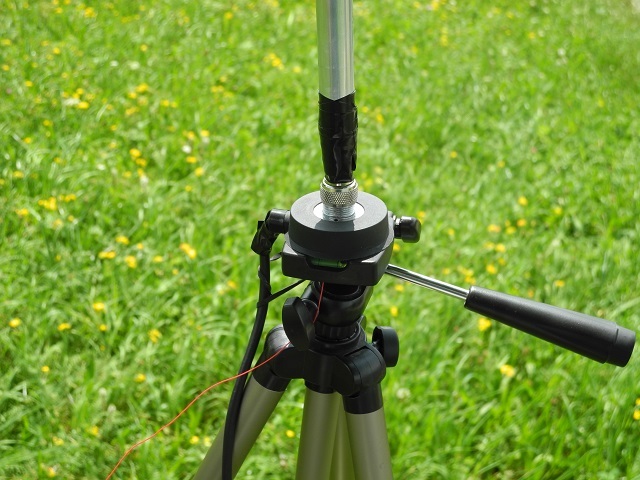 In its standard format the RHM8B connects directly to the BNC antenna connector on the front of an FT817 or similar rig and relies upon the case of the rig to form a counterpoise for what is very similar to a mobile HF loaded vertical whip antenna. I am not happy about the strain that the antenna puts on the FT817 socket and while Martin DF3MC has been having success with his tripod mounted loaded vertical, this prompted me to look at something similar by mounting the Diamond antenna onto a tripod to use it away from the FT-817. I searched on eBAY and found both a suitable camera tripod (used but good condition) and a cable with an SO239 socket on the end of it. This latter is sold to repair VHF magnetic mounts when those fail and as such has a nice plastic part around the base and a mounting bolt on the bottom of it – as you will see from the pictures below. Each of these items only cost a few Euros so if my idea didn’t work, I won’t have lost a lot. After the two packages arrived, my first task was to remove the existing screw from the tripod which is intended to fasten into the bottom of a camera or camera accessory. Even with my limited tool set, I was able to remove the rubber pad to allow me access to the C-Clip which held the bolt in place. With this removed, the bolt dropped out of the bottom of the pivoted plate. There was also a sprung loaded pin, used to ensure the camera was located in the correct direction, this came out very easily with a pair of pliers. Looking now to the antenna mount, there was a rubber mat which I didn’t need so that came off straight away leaving just the slotted locating bolt and a nut under the mount and the RG-58 cable coming safely out of the side to its PL259 plug. Checking the hole versus the bolt size, the tripods hole was too small but after a little work with a knife, it was large enough that I could force the antenna mount in and turn it to form a thread within the plastic plate of the camera tripod. I wanted to have enough thread come through so that I could add the nut back on as this is how I would attach the counterpoise wire. As luck would have it, all worked out well. There were two threads showing once I had tightened down the antenna mount as far as it would go. enough for the nut to hold the (very thin and light) wire I was to use for the counterpoise. 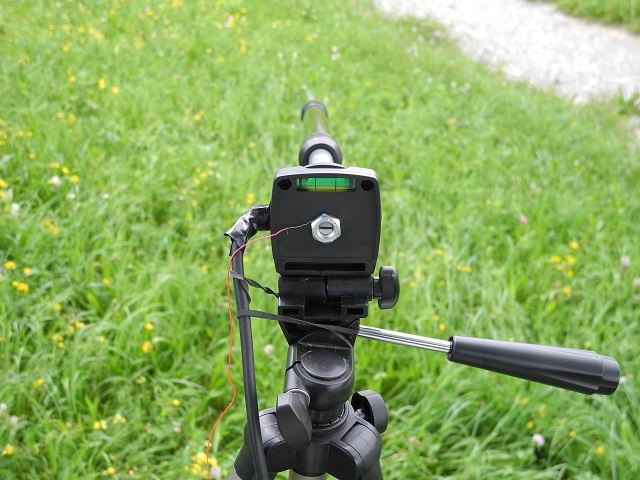 As mentioned above, the antenna socket on the tripod is an SO239. The antenna plug on the Diamond antenna is however a BNC plug. A BNC plug should never be asked to take the physical strain that this antenna puts on it. I have added a BNC to PL259 adapter to the bottom of the antenna and wrapped it tightly with PVC electrical tape. As I now know that this solution works, the next step will be to epoxy glue the base of the antenna to the BNC-PL259 adapter, to make it more solid. Another advantage of the PL-259 mount is that I can also test actual mobile antennas on the tripod as well. Radial or counterpoise? What will be needed. I read on several sites that at least 4, ideally more, radials is the way to go to provide “the other side” of the antenna to a vertical whip. To start with I decided to test with just one long wire to see if it would work at all. The results on 40m were “OK” but other bands were horrible, with the diamond RHM8B on the tripod and connected via the 3m of co-ax to the FT-817. My very first SOTA antenna, or actually a group of antennas were end-fed half wave dipoles, cut to resonance on the required band. When originally making these antennas using my antenna analyser I could see that the counterpoise wire also has a critical length for the complete antenna to be resonant on the required band. The first test was done inside the holiday flat (obviously not the best situation), so as the weather improved, I decided to go out into the country-side. I actually set-up on a “pilgrims way” to continue my tests. The results I got with the “long wire” (non-resonant) counterpoise wire, were similar to those found earlier, “OK” on 40m but not anywhere else. 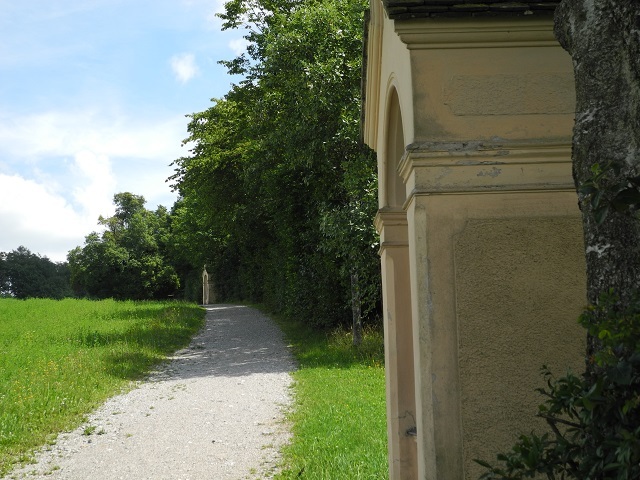 I managed a QSO with Joergen DL2RUF/P who was activating Schloss Neu Golm (DL-04139) in the World Castles Award scheme. He was a good 5-8 with me however he could only give me a 4-4 report. As I had my end-fed-dipole wires and their counterpoise wires in my luggage, I brought those along to the test site. Initially I intended adding them in addition to the existing long wire (radial-wise) but then I decided to check how the individual wires worked independently. Removing the non-resonant wire and adding the counterpoise from my 20m end-fed antenna, I immediately saw improved performance on 20m. 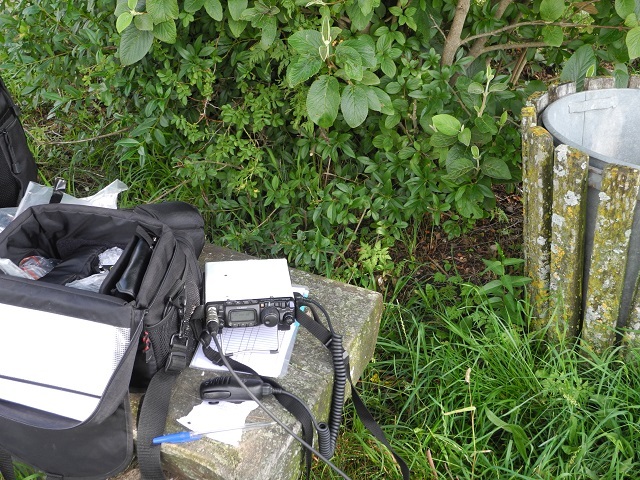 The SWR dropped to nothing and I could hear stations very well and managed a chaser contact with Tom M1EYP/P on G/SP-013 exchanging 5-4 / 5-7 reports. That was a good contact for 5w PEP to this loaded whip antenna! I then tried 40m with the 40m resonant counterpoise wire and indeed the received signals appeared clearer and stronger. I found Carolyn, G6WRW/P activating G/LD-055 but try as I might, I could not get a contact with her in the pile-up. I could also hear most of the stations she was working and I feel certain had I been on a summit I would have been able to make the contact. The Diamond RHM8B can be operated away from the transceiver successfully as long as resonant counterpoise wires are attached to the earth side of the coax. The tripod although aluminium was insulated from the antenna by its various plastic parts and was only playing a “supporting role”. This work was in preparation of my activation of Wendelstein (DL/MF-079) on July 25th. 2014 (see report elsewhere on this web site). While it is not supposed to be a difficult summit to reach, it does attract a lot of tourists and the space on the summit is limited for putting up a squid pole and dipole antenna, so I will be taking the tripod mountable Diamond RHM8B along to use instead of one of my dipole antennas. Since publishing this blog, Ron VK3AFW has suggested I try locating the counterpoise wire in the direction of the stations which I wish to work. A directional vertical antenna? That could be useful…..